Yesterday I loaded pallets of fence posts, barbed wire and bottled water on a trailer pulled by two farmers in a pickup truck. They were bound for Kansas where wildfires fed by wind gusting at 70 m.p.h. burned 650,000 acres and killed thousands of cattle during calving season. Tens of thousands of miles of fence need to be replaced. The home, farm and auto supply store where I work donated the items for Kansas ranchers in the aftermath of this month’s record-setting wildfires. Farmers and ranchers re-earned the state its motto, Ad Astra Per Aspera (To the Stars Through Difficulty). 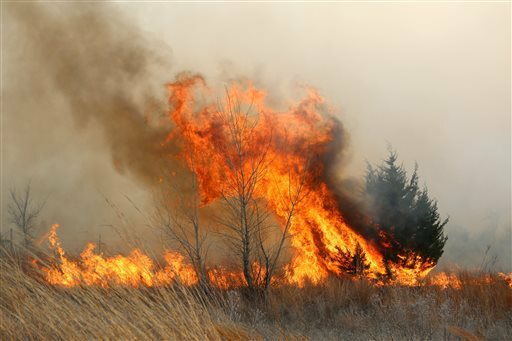 The Kansas plains had become a tinderbox. I hope our small Iowa contribution will help ranchers recover from the worst wildfires in Kansas history. This entry was posted in Environment and tagged environment, worklife, Writing. Bookmark the permalink.